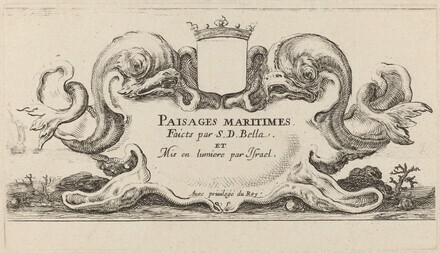 Home » Collection » Title Page for "Paysages maritimes"
Title Page for "Paysages maritimes"
Vesme, Alexandre de (Baudi di Vesme, Alessandro). Le peintre-graveur italien; ouvrage faisant suite au peintre-graveur de Bartsch. Milan: Ulrico Hoepli, 1906, no. 787, i/ii. De Vesme, Alexandre, Phyllis Dearborn Massar.Stefano Della Bella. New York, 1971: no. 787, i/ii. Talbierska, Jolanta.AKWAFORTY ZE ZBIOROW GABINETU RYCIN BIBLIOTEKI UNIWERSYTECKIEJ W WARSZAWIE / Etchings from the Collection of the Print Room of the Warsaw University Library. Warsaw, 2001: no. II. 279.